In 1956, President Dwight D. Eisenhower initiated the people-to-people program which is now known as “Sister Cities International” (SCI). Since then, 1,100 U.S. cities have become part of Sister Cities International, with ties to 1900 cities in 120 nations. municipal level, promote cultural understanding and stimulate economic development. 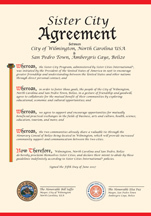 In September 1986, the Wilmington City Council established a Sister City Commission as a local partner to SCI. In 2004, the Sister Cities Association was formed as a private, non-profit membership based organization that provides community involvement in sister city relationships. Today, Sister Cities International, Wilmington Sister City Commission, and Sister Cities Association of Wilmington are a three way partnership sharing the same mission. interested in promoting global cooperation at the local level. meaning of Section 501(C)3 of the Internal Revenue Code. 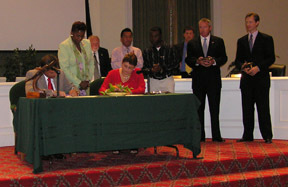 Wilmington Mayor Bill Saffo (seated, left) and San Pedro, Belize Mayor Elsa Paz (right) sign the official agreement establishing a sister city relationship between the two cities in June 2007. The Association creates and strengthens sister city partnerships in an effort to increase global cooperation and promotes opportunities for international partnerships for citizens, businesses, schools, and organizations in Wilmington. Activities include: cultural events, youth programs and exchanges, teacher sponsorships and exchanges, hosting international visitors, economic development and more.